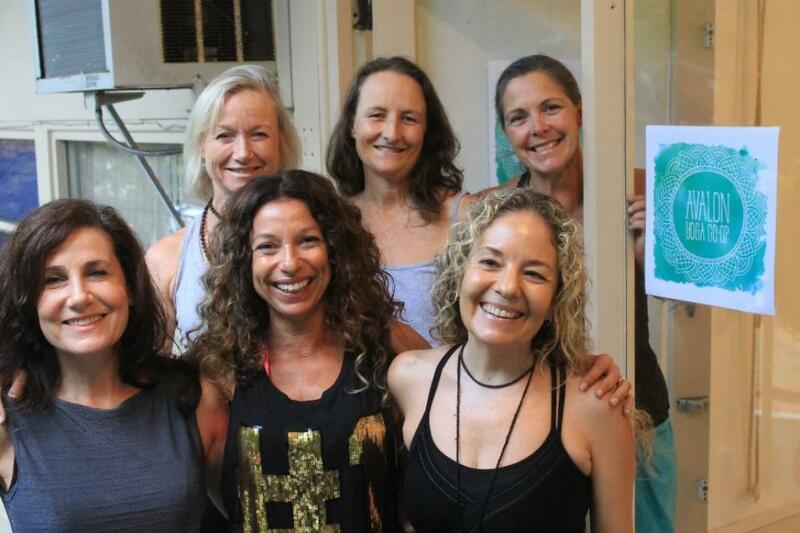 The Avalon Yoga Co-op teachers - from back Christine Hopton, Jacqui Guiliano, Jane Crosland - front: Tracy Chambers, Jo Longhurst and Jenny Segail. Avalon Yoga Co-op is a group of passionate yoga teachers who are collaborating to bring authentic, affordable yoga to the Avalon community and beyond. 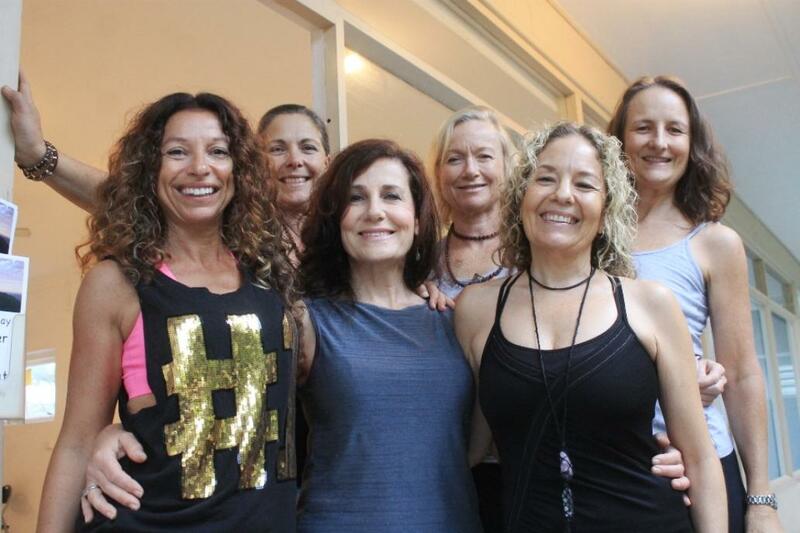 Offering a range of yoga classes, Jacqui Guiliano, Jane Crosland, Tracy Chambers, Jo Longhurst, Christine Hopton, and Jenny Segail are the six Pittwater yoga teachers who have taken over the wonderful studio upstairs on the corner of Bellevue Avenue and Avalon Parade to continue the legacy of yoga in this space in Avalon. The first classes were run yesterday under this cooperative venture, Saturday April 9th – congratulations ladies! Yoga is a physical, mental, and spiritual practice or discipline which originated in India in pre-Vedic times. There is a broad variety of schools, practices, and goals in Hinduism, Buddhism and Jainism. Among the most well-known types of yoga are Hatha yoga and Rāja yoga. Hatha yoga, in broad terms, denotes a system of physical techniques supplementary to a broad conception of yoga. Hatha yoga, particularly asanas (the physical postures), has become popular throughout the world as a form of physical exercise, and is now colloquially termed as simply "yoga". Hatha yoga consists of eight limbs focused on attaining samādhi (a state of meditative consciousness where the mind becomes still producing a state of being totally aware of the present moment). In this scheme, the six limbs of hatha yoga are defined as asana, pranayama, pratyahara, dharana, dhyana and samādhi. It includes disciplines, postures (asana), purification procedures (shatkriya), gestures (mudra), breathing (pranayama), and meditation. The hatha yoga predominantly practiced in the West consists of mostly asanas understood as physical exercises. It is also recognised as a great stress-reducing practice. Pranayama is the formal practice of controlling the breath, which is the source of our prana, or vital life force. This too is considered by many to be one of the foremost branches in yoga with whole health restored through the exercises to produce a more relaxed you. As Autumn has always been a traditional golden time of cleansing, letting go and recharging the batteries, this season would be an ideal time to invest in your own lifelong health and address any physical manifestations of underlying issues or just take your fitness up a few notches. This is definitely something for your mind, your body and your soul. The girls are also looking to expand the space to other teachers so let them know if you are interested in renting the room for any classes or workshops. You can contact them through their Facebook page. Jane’s great love and passion is restorative yoga and relaxation for mental wellbeing. Helping people to find ways to a more peaceful life is her goal. After spending most of her career in the corporate sector (advertising in particular), Jane changed her life through practicing yoga, as it was always where she went in times of stress and uncertainty. After practicing regularly for 15 years or so, this lead to a desire to pass on yoga’s ancient and profound teachings to people in similar situations. She immersed herself in a year long yoga teacher training program and is a fully qualified yoga teacher (Yoga Australia Level 1). Jane has continued has her studies with renowned yoga nidra and relaxation masters – Swami Shankardev and Rishi Vivekananda from the Satyananda tradition at Manly Yoga. Teaching yoga for mental wellbeing is an area where modern psychology meets Eastern wisdom and Jane’s recent study in this area has resulted in a teaching practice that is accessible to everyone, with or without experience in yoga or mediation. Mind Over Matter – The Art and Science of Relaxation is Jane’s corporate training company. Programs are developed for businesses that wish to provide their staff with the tools needed to reduce stress and anxiety in their lives. This is achieved through restorative yoga postures, deep relaxation and breathing techniques. A lover of nature and wildlife she has her carer’s licence and volunteers with local environmental groups, and believes that we all need to practice some karma yoga (the yoga of selfless service) to truly give us peace and perspective in our fast and demanding lives. Jo is our certified Iyengar yoga teacher has been teaching Iyengar Yoga for 15 years. She is passionate about her teaching and helping her students grow with their yoga. Jo emphasizes correct posture and alignment that helps them in their every day life. As well as regular Iyengar classes Jo also teaches kids classes and monthly yoga rope workshops, a unique Iyengar yoga experience with lots of hanging and swinging in the ropes. Jo works in a monthly cycle so one week will be standing poses, then hips, twists and forward bends, then backbends and the last week more restorative. We use props to gain the correct alignment and the classes are always sequenced. Jo will always give her students attention and adjustments. Jo is also very passionate about teaching kids yoga “you are never too young to start yoga” the earlier you plant that seed the easier and better. Jo introduces Iyengar methodology to kids in a fun and relaxing way so that they can use these skills in overcoming day to day stressful encounters. Look out for school holiday workshops in the future. 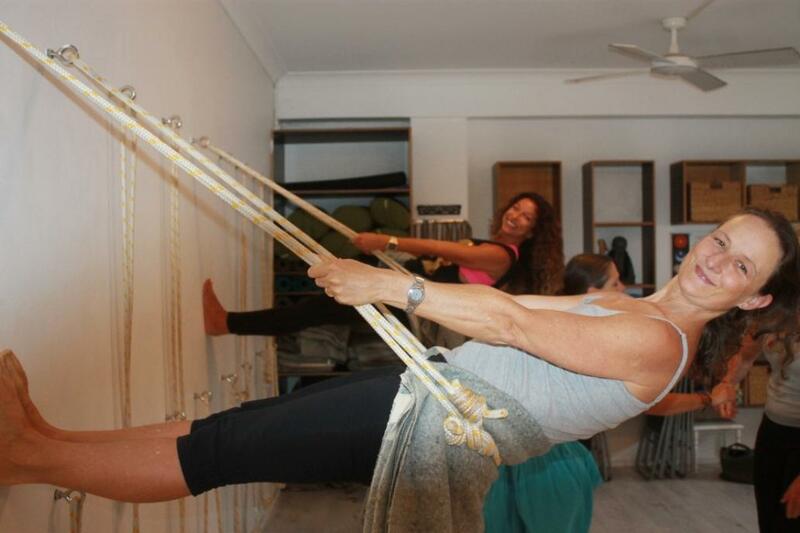 Jo runs monthly Rope workshops from the Avalon Yoga Co-op studio. These classes teach posture alignment with the use of ropes in a gentle and supportive way. By being able to experience correct posture alignment with the help and support of the ropes students can get the feel that can translate to their practice on the mat. These classes are limited in possible class numbers so places are only available by pre booking with Jo. Tracy is a passionate yoga teacher who thrives on creating unique, seasonally attuned classes tailored to student needs. Her classes are infused with ancient yogic wisdom and her own life learning. Tracy’s classes create a vital pause in daily life, helping us to connect with the bigger picture by providing space from habitual ways of thinking and being in our bodies. Her desire to become a yoga teacher was born from a long battle with a chronic health condition for many years. Tracy will also be holding a variety of special events, workshops and courses at the Co-op such as the deep immersion found in Dreamtime Yoga and Didgeridoo events, informative and experiential Yoga For Health workshops, seasonally flavoured Yoga Flow evenings plus much more. Keep an eye on our website and Facebook page for details. Seasonal Hatha class - Monday morning: 9.30 – 11am. Jenny Segail started doing yoga over 17 years ago as a solution to her lower back and neck issues. Using a combination of massage and yoga, she found that yoga helped to strengthen her body, improving her flexibility and ultimately improving her pain. Her journey opened up a world that she never expected. She found that yoga calmed her mind and helped with the stresses of daily life. It fitted in well with her Vegan lifestyle. Jenny is very passionate about healthy eating and uses diet to heal the body and extend longevity. Jenny has studied yoga with Judy Krupp, John Ogilvie, Geoff Brooks, Fabio Fabbri, Yolande Hyde, Christina Pateras and Lucy Andrews, as well as doing numerous intensive workshops along the way. She has been privileged to do workshops with Donna Farhi, Mark Whitwell and Lesley Kaminoff and regularly visits John Ogilvie’s and Geoff Brooks’s Studios in Byron Bay. Her Teacher Training was completed through Byron Yoga. Jenny’s style of yoga is hatha based, with a strong influence on yoga poses that flow from one to the next, strengthening the body, improving core strength and quieting the mind. Students are encouraged to tap into their inner wisdom and make the practice their own. Jenny qualified as a graphic designer and today runs her own business as an event decorator. She paints on the side and held her first art exhibition at Global Gallery in Paddington in 2011. Jenny teaches at the Avalon Yoga Co-op as well as the Yoga and Health Collective in Mona Vale. Christine is a Level 1 Yoga teacher practising at Avalon Beach on Sydney’s Northern Beaches. Chris has practiced yoga over 30 years under teachers including Rick Birrell, Carolyn Harris, Iyengar teacher Lynne Styman Lane, Sylviane Gordon, Yolande Hyde, Fabio Fibbri and Jacqui Guiliano to name a few. She currently teaches two Sunrise classes on Mondays and Fridays at the Avalon Beach Surf Life Saving Club in a fantastic space overlooking the ocean. Chris supplies mats, blocks, blankets and straps and starts her classes with a short mindfulness practice with some breath work, before moving into asanas and finishing with relaxation. Her other classes are at the Avalon Yoga Co-operative. Here there is a great little studio with all equipment plus the added bonus of wall ropes. Christine likes to incorporate these into her classes where possible. The Monday night class is designed for beginners through to general students and ensures you leave feeling calm, relaxed and beautifully stretched. 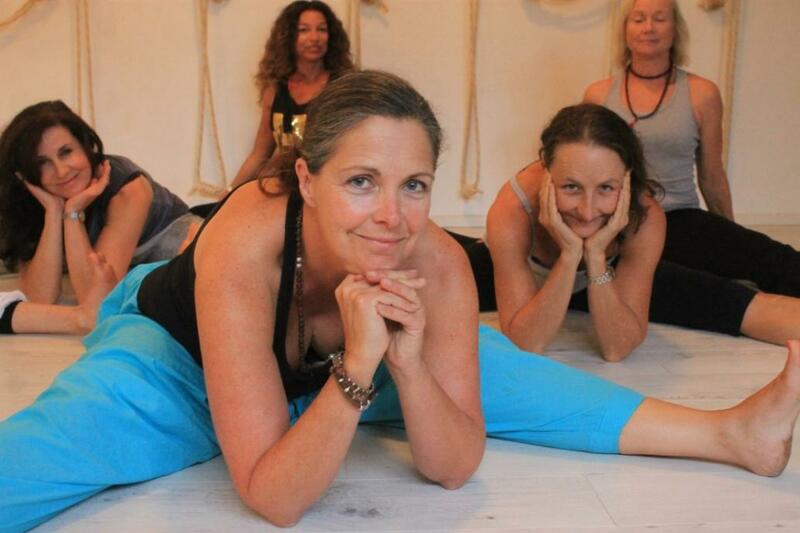 Jacqui is a senior Level 3 Hatha yoga teacher with 30 years of yoga practice and twenty years teaching experience. Jacqui brings joy and warmth to her classes with attention to the breath, alignment and the seasons. Jacqui runs the Healing with Wholefoods course and yoga retreats in Australia. She is also a shiatsu practitioner. Jacqui’s teaching embraces her backgrounds in hatha yoga tradition, tantra advaita philosophies, traditional Chinese medicine and meridian theory, seasonal and wholefood healing. Looking for balance, integrity and meaning of yoga on the mat and in our lives is what inspires her teaching.